My niece just turned 9. Besides a Build-a-bear (which Grandma already got her) and a cotton candy machine (which I thrifted for $7.99 at Thrift Land here in Austin--woohoo! ), there wasn't too much she'd asked for. That's where the handmade stuff comes in! Sacrifice a little time, some materials you already have (and BOY do I have some materials! ), and you'll give a gift that will be cherished for years to come! I have three boys. I do not get to buy stuff with hearts, rainbows or fluffy clouds. I went all out on finally getting to make a super-girly accessory. 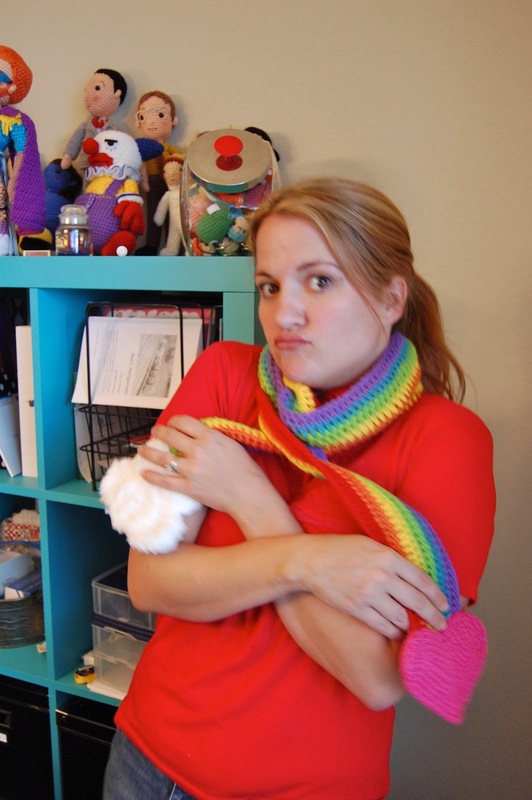 Browsing Ravelry I'd seen several rainbow scarves. They were all basically the same so I just winged it. I got out a rainbow of similar-weighted yarn, all washable acrylics, and got to work. Here's a simple tutorial if you'd like to make your own! Ch between 152 and 252 ch (depending on child's --or adult's-- height). R1: Dc into 3rd ch from hook and each subsequent ch. Change colors on the last stitch, using the new color to complete the stitch. R2: Ch 2, turn. Dc into each st.
Repeat R2 until you have finished all the colors of your rainbow. Weave in ends. With white fluffy yarn, make an adjustable ring and ch 1. Sc 6 into ring and pull closed. Fasten off and leave tails. Using the yarn needle, overlap five of the circles to make a fluffy cloud shape. Sew them together with the yarn tails. 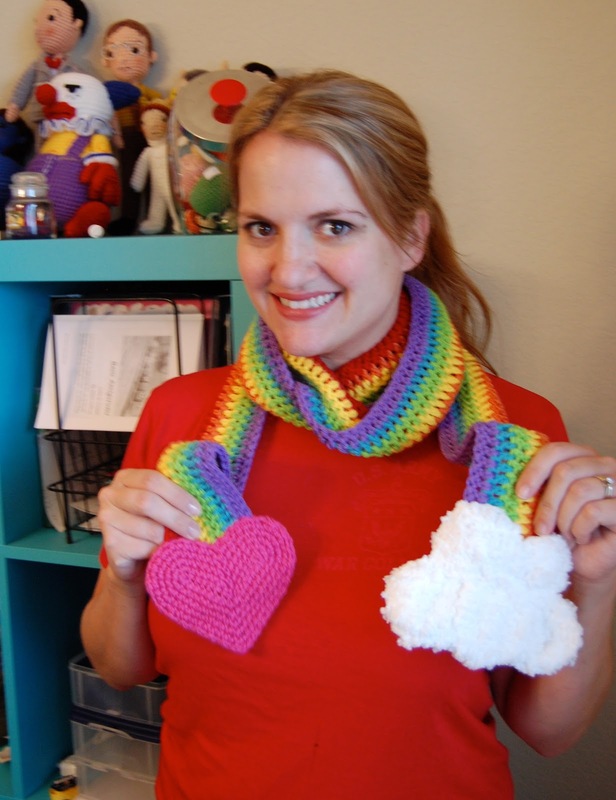 Sew the assembled cloud to one side of the scarf end. Flip cloud over and sew the remaining circles to the back of the cloud, lining them up. You may lightly stuff the cloud if desired. Weave in ends. Refer to THIS pattern to make big pink hearts. Thanks Red Heart and fabulous designers! Sandwich the hearts together and stitch the bottom halves together. Insert the end of the scarf and continue stitching them together through the scarf. Weave in ends. Just in time to make several for Christmas! Am I right? Too cute! I bet your niece will just love wearing that scarf. Although, maybe you'll have to make one for yourself, too! Wow! The scarf is gorgeous, I love it! Thanks everyone! It's so fun and quick! Here in Texas I have plenty of time to make another for myself too! 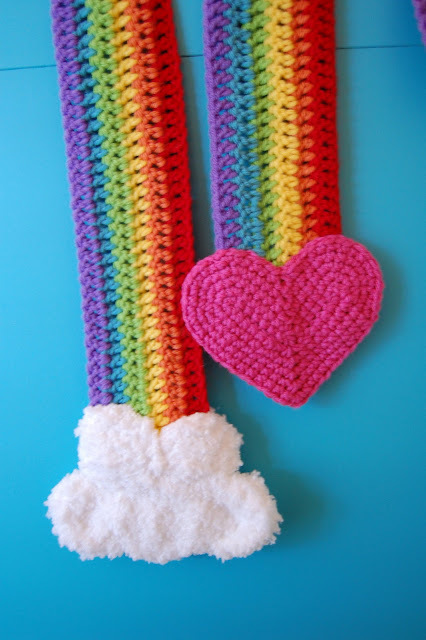 I think I'll use this for a nyan cat scarf! oh my gosh! i have a 9 yr old niece that is in love with rainbows! Her birthday is in one week...i just sent her birthday present, but i'm going to drop everything and stitch this!! she's gonna love it! This is adorable. Would it be ok if I made some up to sell at local craft fair? I think the young girls would love them!! Love this! I can use my yarn stash colorful bits to make this scarf for Operation Christmas Child! Thank you!